Corporations without commitments to social and environmental impact focus on turning a profit and producing products as cheaply as possible. While this sounds reasonable from an economic perspective, human health is the primary cost. Genetics and gene mutations cause cancer, but what causes gene mutations? A medical system that treats the symptoms of cancer rather than the root causes of an epidemic. A cure for cancer lies in addressing the factors above. Unfortunately for us humans (and our animal friends), prevention of cancer is not profitable for the cancer industry. The cancer industry includes corporations, like Bayer (recently merged with Monsanto), which produce food, home and beauty products, drugs, and pay for cancer research. A conflict of interest to say the least, corporations like Bayer profit simultaneously from genetically modified food grown with pesticides (both of which cause cancer); home and beauty products made with unregulated, cancer-causing chemicals; and the production of cancer treatment drugs. Corporations finance a vast majority of cancer research—through medical institutions, government, and nonprofit organizations—and direct the research focus towards cancer treatment and the development of pharmaceutical drugs. Cancer treatment is critical for someone diagnosed with cancer, and advances in conventional medicine are an imperative part of saving lives. However, why is there not more research to keep people from getting cancer in the first place? Cancer-causing pollution and chemicals in our air, soil, water, food, and products along with the lack of environmental regulations guarantees a steady stream of new cancer patients. Increasing cancer diagnoses also provide the necessary statistics for continued cancer research, most of which is to develop more drugs. Corporations cannot profit in cancer prevention, and in fact, addressing the real cure for cancer could potentially topple a billion-dollar industry. The most effective marketing tactics feed on fear and there is no shortage of fear when it comes to cancer. People are so afraid they will often believe anything positive or hopeful about cancer, including supporting cancer awareness and find-a-cure campaigns, many of which are riddled in deceit. Cancer campaign marketing efforts draw attention to popular brands’ support of cancer campaigns, while deceiving consumers from the truth that these same brands sell products with cancer-causing chemicals. For example, Estee Lauder and Avon are key supporters of the Breast Cancer Pink Ribbon Campaign, even though numerous products contain parabens and phthalates—xenoestrogen chemicals that cause breast cancer. As a marketing professional for twenty years, I understand how corporate money persuades public opinion. As a breast cancer survivor at 42 who has uncovered the cause of the cancer that invaded my body (which includes a combination of the factors listed at the start of the article), I understand what it means to have cancer in a medical system driven by profit, not prevention. Cancer has drastically changed my life and preventing cancer in my body going forward is my top priority. I also want to help people feel empowered to make changes in their lives that lead to the prevention of cancer and to advocate for themselves and their health in a fear-based system. Cancer affects people of all races, ages, genders, socio-economic backgrounds, and political ideologies, with an additional layer of social and economic disadvantages and injustice for marginalized populations, including an inequitable health care system. Can we find common ground to demand cancer prevention from our medical system? Can we change how we spend our money to support socially responsible companies that do not contribute to the cancer epidemic? Can we advocate for an equitable health care system for humanity? Can we be the change we want to see? 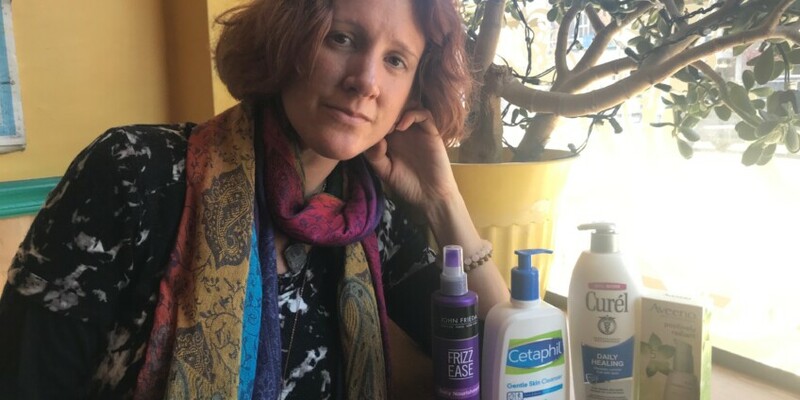 Rae Carter (pictured with a sample of products that contain chemicals known to cause breast cancer) spent the past year healing from breast cancer and several connected health issues following a 20 year marketing and public relations career. She serves on the board of Vermont Businesses for Social Responsibility and lives in Plainfield, Vermont. Connect with her at www.facebook.com/RaeCarterEmpowerment or on Twitter and Instagram as RaeChiVT.